Great comedians have a way of making the art of comedy look easy; and Oliver Samuels does just that! 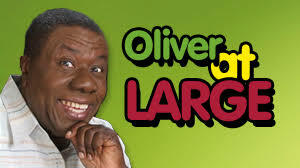 His journey from making those on the plantation where he grew up laugh to having a successful TV series, Oliver At Large, which tickle people all over the world, is proof that hard work pays off! Click the video below as I share what I enjoy about Oliver's work and my favorite episode of Oliver At Large, which still makes me laugh out loud. As with my previous shares, I would love for your to support Oliver Samuels by checking out his work. I searched on-line for a vendor that sells DVDs of Oliver At Large, but, I came up empty handed. Nevertheless, here's a link to clip of my favorite episode, Airport, that I found on YouTube. Click, kick back and get ready to LAUGH!